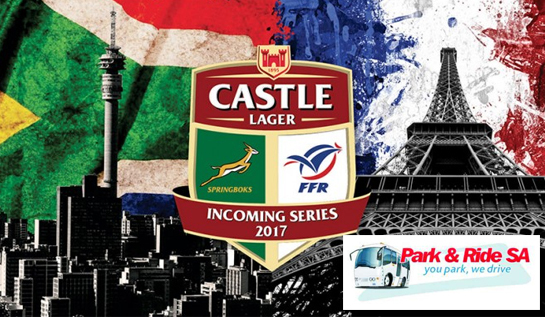 Park & Ride facilities for the Castle Lager Incoming Tour, South Africa vs France Rugby Test 3. SA vs France Test 3 Rugby at Emirates Airline Park on 24 June 2017. Busses depart promptly at 14:30 on 24 June 2017. The busses are stacked and once they are filled they will leave. Busses do a return trip and start leaving the venue immediately after the event. Take your Computicket ticket to indicated area. You will receive a color coded wristband and be directed to the buses.